Namaskaar. With this Part 15 we conclude our multi-part series from Chapter 2 of Bhagavad Gita titled “Sthitaprajna – Person of Perfection” with Verses #71-72 with a commentary by Smt Jaya Row. This has been a most enjoyable experience for me to share the verses here and also learn along the way. The teachings of the Gita are such that each time one reads, one gets a new insight into them. So it has been for me too. Namaskaar. We move on with Part 14 of our ongoing multi-part series “Sthitaprajna – Person of Perfection” with Verse #70 of Bhagavad Gita Chapter 2 and a brilliant commentary by Smt. Jaya Row. She has quoted Lokmanya Tilak from his brilliant treatise “Gita Rahasya” a commentary on the Gita, originally in Marathi. She has often used this example to drive home the point on managing desires. Here she has explained in brief but for those interested in a detailed explanation, please visit the website and get the DVD on this entire series here. Its a treasure to have, such a wonderful indepth commentary, so simply explained. Namaskaar. Moving on to Part 13 and Verses #68-69 from Bhagavad Gita Chapter 2 in our ongoing series “Sthitaprajna – Person of Perfection” with a commentary by Smt. Jaya Row. Such important concepts explained in such simple terms by her, thats the beauty of a Jnani speaking. Namaskaar. In part 12 of our series “Sthitaprajna – Person of Perfection” we have 2 great verses #66-67 from Bhagavad Gita Chapter 2 and an outstanding insightful commentary on these by Smt. Jaya Row. So brilliantly explained with the help of examples, great choice of words to explain subtle concepts in such a lucid and simple manner. Namaskaar. In Part 11 of our series “Sthitaprajna – Person of Perfection” with commentary by Smt. 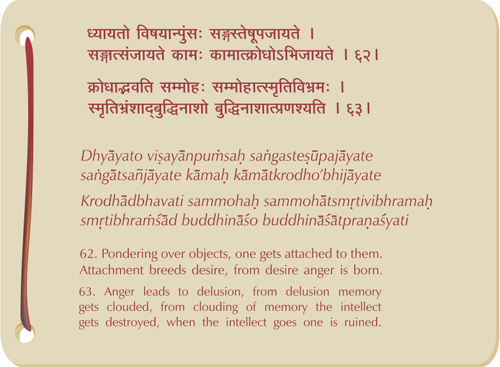 Jaya Row, we move on to Verse #65 of Bhagavad Gita Chapter 2. Its a reaffirmation of the teaching in the previous verse and a sort of confirmation of what the benefits of a trained mind would be. Short, sweet, to the point! In verse 64, He gave us the formula for self-control. Once the intellect governs the impulses of the mind by default all your actions become benign. When likes and dislikes propel activities the actions turn malignant. They harm and destroy you. And a fresh experience should not create a new wave of desire. After the contact with the object ceases, your mind should not regurgitate and dwell on that enjoyment. Lastly, when you grow to access higher planes of happiness the senses lose their charm. They no longer interfere with the pursuit of the Divine. And Krsna says `one who has controlled the senses achieves peace’. In this verse He says – in that peace which you have obtained as a result of practising self control all your sorrows are destroyed. The sorrow comes when a desire is left unfulfilled. In a peaceful, tranquil mind the intellect becomes sharp. Even sportspersons accept that they achieve peak performance only when their mind is relaxed. All athletes acknowledge that among the finalists, the difference between you and your competitor is minimal. The mind determines whether you win or lose. When you have a relaxed mind your intellect is sharp. You are able to think with clarity. You become efficient, productive, successful and prosperous. When you control the senses you become a happy person as well as a prosperous person. These two attributes are almost always mutually exclusive. A person who is successful and prosperous is invariably not happy. And a person who is happy is usually not prosperous. But you want a combination of both. You achieve that amalgam through the Gita. So the endeavour should be to have a peaceful mind and a sharp intellect. If you have these two you achieve both material and spiritual excellence. External enrichment is possible only when the mind is enriched. Namaskaar. A very powerful message from Verses #62-63 of Bhagavad Gita Chapter 2 in Part 9 of our ongoing series “Sthitaprajna – Person of Perfection” with commentary by Smt. Jaya Row. She has explained the teachings of these verses so systematically how just one wrong, unattended thought can destroy our entire personality leading to destruction. A virus has to be contained immediately without allowing it to spread. We have to literally put up a NO ENTRY board in our mind. A board that says No Admission Without Permission!! A resolve not to let any unwanted thoughts enter our system. When the intellect is not deployed you go down the stairway to destruction. One thing leads to another and before you know it ruin stares you in the face. Only the intellect safeguards you from this predicament. Namaskaar. 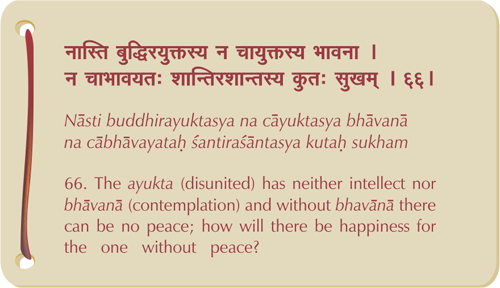 Moving on to Verse #61 of Bhagavad Gita Chapter 2 in our ongoing series “Sthitaprajna – Person of Perfection” with commentary by Smt. Jaya Row. Here she explains what the Lord actually means by ‘Meditation’. An untrained mind is not fit to meditate and the effects can be the opposite of what is desired. Some profound statements from her drive the points home! Namaskaar. In this Part 7 of our series “Sthitaprajna – Person of Perfection” from Bhagavad Gita Chapter 2 we move on to verse #60 with a wonderful commentary by Smt. Jaya Row where she talks about the weakness of the senses and the need to sharpen the intellect, a lesson that she has been drilling into us from the very beginning. Giving a free run to the senses, as we are prone to do, can be disastrous and end in ruin! Much emphasis is placed on sense control. People embark on the spiritual path with sincerity and commitment, but how many pay attention to sense control? How many people even understand what sense control is? Sense control is not sense denial as is usually believed to be. The sense objects turn away from an abstinent person but not the rasa or relish. Even the relish turns away on seeing the Supreme. Here again he gives a very practical tip. If you want to control a weakness, as you make up your mind and exert your will, automatically the object turns away. When a diabetic person is advised to refrain from sugar the desire to eat sweets increases. But the truth is that the moment he makes up his mind not to eat it, he finds the sweet itself disappears from his table! This happens in the case of other objects as well, like alcoholic drinks. When a person is fond of drinks he is always in the company of other people like him and drinks are always available to him. But the moment he makes up his mind to abstain, not only does the object leave him but also the friends who indulge in the same enjoyment also desert him. However the rasa or relish does not go. It remains with you until you reach the Supreme. The rasa also goes when you realise the Self. Realisation is infinite happiness. Compared to the infinite all finite entities lose their appeal. The message is that you have to be alert and vigilant all the time. Till Realisation, the taste for sense enjoyment lingers. It can surface at any moment and take you away from the path. The story goes that Parvati wanted to marry Lord Siva, the epitome of asceticism. She asked for permission to serve him. Siva accepted her services but married her only after vanquishing Kamadeva the god of love. Even Lord Siva took adequate precaution knowing the power of the senses. In contrast, the modern generation goes headlong into sense indulgence with no thought of inner fortification.